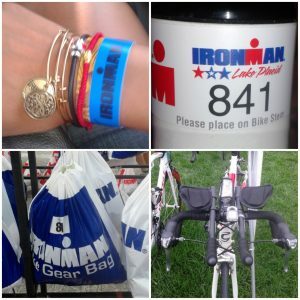 SPEAR's Amelia Rivera's IRONMAN Race Report! 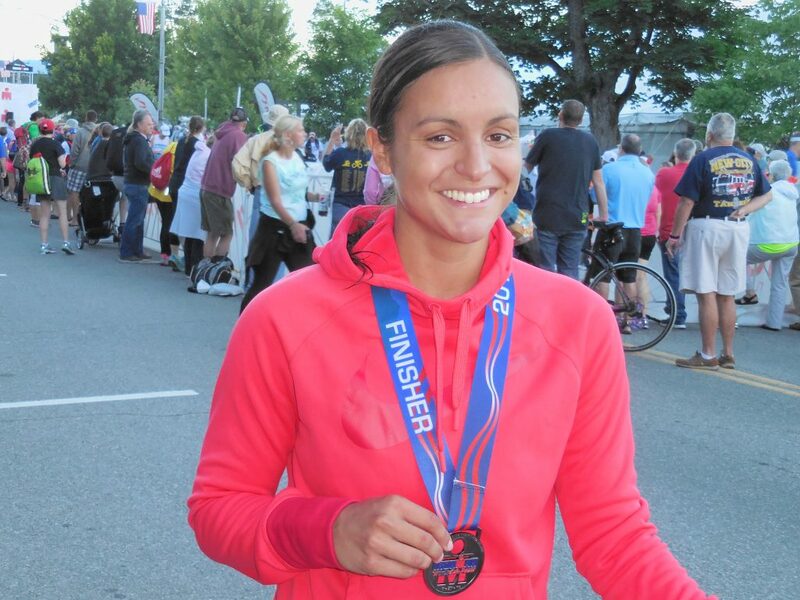 44th Street Physical Therapist, Amelia Rivera, recently completed her very first Ironman triathlon at last Sunday’s Lake Placid competition! 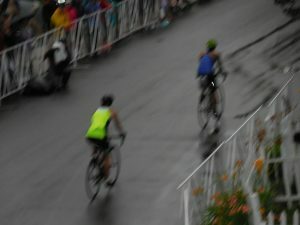 That’s 2.4 miles of swimming, followed by 112 miles of biking, capped off by a 26.2 mile run (that’s right, a MARATHON). 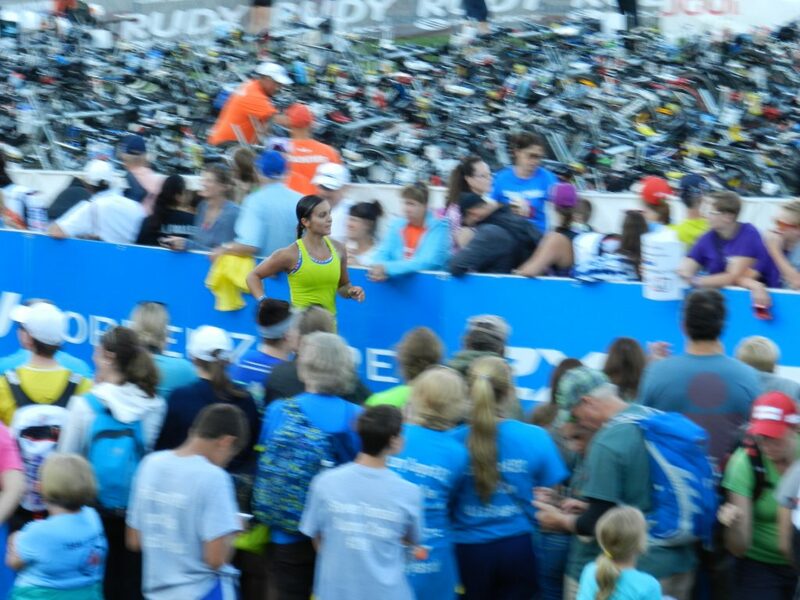 Ironman triathlons are widely considered among of the toughest on earth and Amelia completed hers well under her goal time! The following is Amelia’s riveting race report, detailing all 140.6 miles of her incredible journey! I wake up at 4:15AM surprisingly calm; a little nervous but not outrageously. I’m not hungry, which is a problem because I hate forcing food down my throat but I know if I don’t eat, I will regret this decision 14 hours later. Pre-race breakfast is cold pizza, a banana with almond butter, orange juice, and a hard-boiled egg (yum meal of champions right there). By 4:35 I am out the door with my Morning Bag consisting of my wet suit, cap, goggles, and all my water/Emergen-C that I didn’t want to leave overnight in transition. My Dad drives me as close as he can to the start but I know I am inevitably going to have to walk at least a half a mile to get there. By the time I get body marked and check my bike tires it is a little after 5am. I am hungry and getting the nervous shakes. In my Morning Bag I find little post-it notes my friend Jen and my parents had written the night before. Really adorable, inspirational sayings to just keep focused and have fun. I feel myself calm down, and start to feel thirsty (which makes me panic because I don’t want to waste my bike water bottles), but I am a little relieved all at the same time. I make my way to check my Transition Bags and call my parents to grab an extra bottle of water for me to drink before the swim. As I am walking to the lake I realize there are just way too many people. I can’t even find the select few who I know are doing the race. I just keep thinking relaxing thoughts, that there is no need to panic about the one part of the race I am least stressed about. 6:10AM and all the athletes are lining up. I still haven’t seen a single familiar face. And then I see my Dad, screaming and camera ready. I feel relieved AND he has a bottle of water! He tells me good luck, I smile, chug the water and I am off. I line up with the sub 1 hour group, which is intimidating because it is the heat after the professionals and it is 99.5% male. I manage to find the four other brave girls in the heat and we comfort each other and wish each other good luck. It’s 6:30AM and the race has begun. I carefully enter the water in a massive crowd of splashing and kicking. For the first 10 minutes I am getting kicked in the face and swallowing water. I begin to panic. 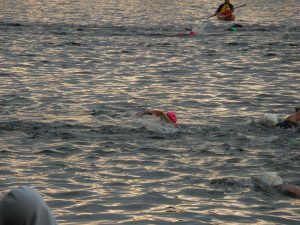 Why in God’s name are people kicking this aggressively in a 2.4 mile swim? I move over to the side and begin to calm down again and find my rhythm. The crowd thins out by the first half of the first loop. I am just pacing myself trying not to over exert my energy. By the end of the first loop I get kicked in the head so hard I see stars and begin to get calf cramps (another huge fear). I relax my legs and just keep going. I run out onto the timing mat and begin my second loop. 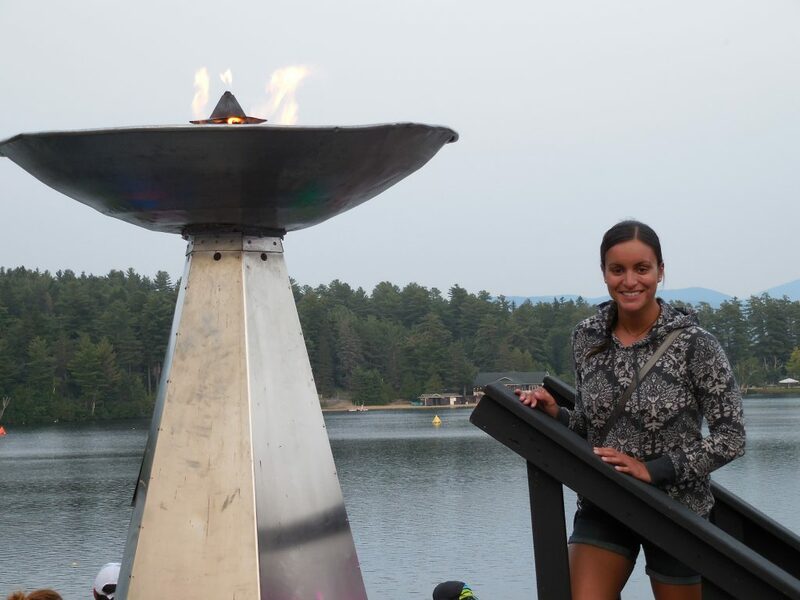 The second loop is surprisingly challenging because by this point all the athletes are in the water. The water is crowded now, not just with over-enthusiastic elite swimmers but now with swimmers who are not as strong. Again I swim on the outside away from the crowd trying to just pace myself. 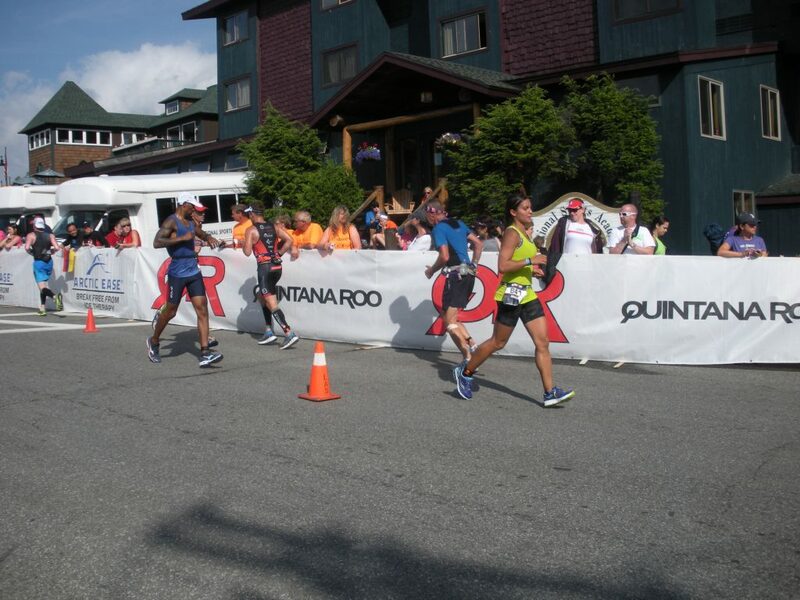 Towards the end of the second loop I get kicked in the face again and start to get calf cramps again! 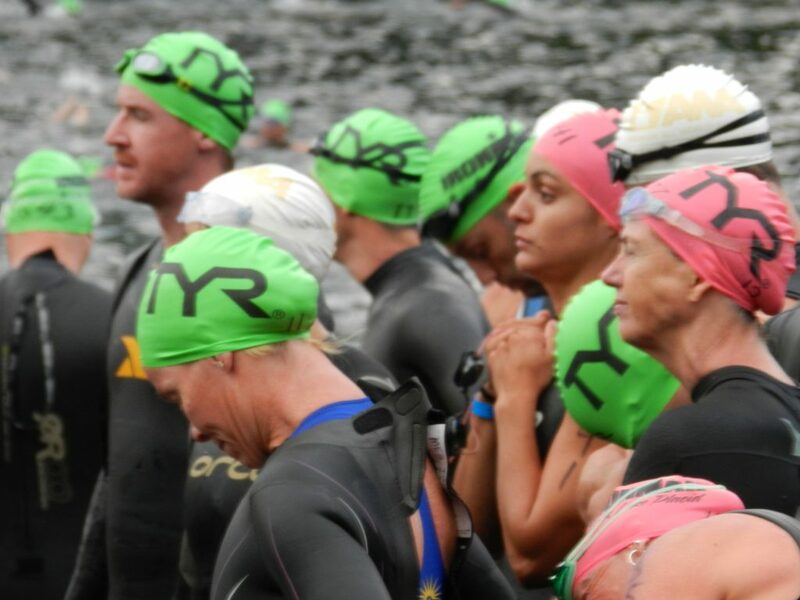 I remain calm and try to focus on the last few minutes of the swim. Finally the second lap is done and I am about to jog to transition when all of a sudden there begins a torrential downpour. Not good. My other fear was biking in the rain! I try not to think about it. I see my Dad again and smile. I proceed to some volunteers who help me get out of my wetsuit. I enter the changing tent and begin to change into my biking gear. Surprisingly enough there is hardly anyone in the tent yet. I jog to my bike and say a prayer. The rain is getting stronger and more ominous. I mount my bike and I am off; terrified, gripping my brakes for dear life but remembering to breathe. I can’t see a thing for the first 10 miles. There is so much rain, thunder and lightning. My glasses fog up so much I take them off and proceed to feel like I am being stung by a million bees on my face from the rain. But at least I can see a little bit better. At one point I am going 42 mph in the rain, down a hill, that has sharp turns. Did I mention that the cycling portion is my weakest part and the part I am most terrified for? All I can remember from the first loop other than the first 10 miles are the last 10 miles. The last 10 miles are all uphill with barely any downhill recovery. I am struggling. So many cyclists have passed me already but I know that I am holding the pace I can manage for 112 miles. By the end of the second loop, the rain has finally stopped and I am excited for my Special Needs Bag. I have pizza, ginger ale, Twix and some additional Clif Bars for the course. I pause for 5 minutes to rest my back and enjoy my treats. Onto the second loop. I am well ahead of my goal time and just want to pace myself for this loop. The first loop has gone so fast, I am nervous that I have gone out too strong. I just keep breathing and trying to remain calm. My only concern at this point is the last 10 miles. The first time around was rough, I can only imagine what is going to happen the second time around. I make the decision to break the second loop into 20 mile increments. I stop to use the restroom, chug two bottles of water and eat two Clif Bars. I feel great. I go for another 20 miles and do my best to stretch my back and rehydrate. At this point it has gotten humid and hot. My back is hurting to a point of agony and I am about to approach the most dreaded part of the course. I tell myself, well you made it this far without a flat tire and are about 1.5 hours ahead of your goal time, just take it easy and focus on the next part; the marathon. Surprisingly the last ten miles are not as bad as I thought they’d be. By this time there are way more spectators which helps tremendously. 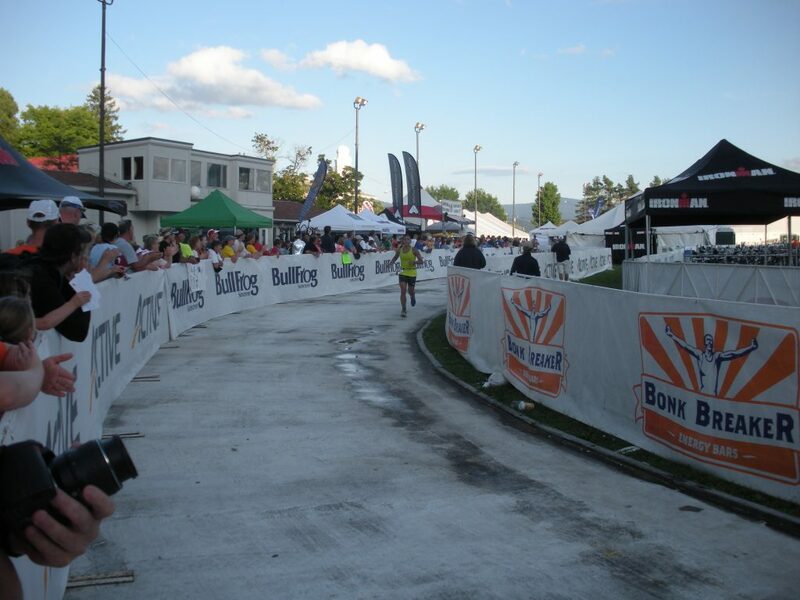 After the final sequence of hills, I coast into transition and dismount my bike, handing it off to a volunteer. As I am walking into transition (no jogging this time) I can’t feel my left foot. I panic. My toe is killing me. I have Advil which I have been basically consuming like candy by this point. I take my time in transition to the run. I sit down, chug water, and wiggle my toes. I change into my running clothes and stretch out my back. I use the restroom and eat some Clif Shot Bloks. The volunteers wish me luck and I am walking to the marathon. I am a little concerned about my foot but a few spectators say “Go Amelia!” I think it is my parents but it is only strangers. At this point I am starting to get a little delusional, realizing that I’ve forgotten my name is on my Bib. Seriously, how else would they know my name? I laugh at the lapse in judgment and begin to jog. I feel OK. I keep telling myself slow and steady; take deep breaths, focus. People are cheering my name; which I still haven’t gotten accustomed to but I laugh and smile. As I am jogging I find my pace and begin to get into a rhythm. I love running; I just hope I have that same thought process 23 miles from now. The course is surprisingly flat with only two noticeable hills on the return trip to the transition area. I keep focused and just remind myself, you are ahead of your goal, just enjoy the race don’t worry about anyone else. Soon I am halfway through the first loop, and then I am on my way back to transition. My foot isn’t bothering me but I do notice my knees starting to ache. I make the decision to walk the first hill, jog the next 2 miles and walk the second hill. The next thing I know I am almost half way through the marathon and am approaching my Run Special Needs Bag. I am so excited. I shout my number and a volunteer grabs it for me. I tell him how I’ve been looking forward to this all day. He laughs. There is (again) a slice of pizza, ginger ale and some more Clif Shot Bloks. I also have a small almond butter with jelly sandwich. I chug the ginger ale, nibble on the real food I have and then I am off. I am having fun! There is music and so many people. I finally see my parents and Jen as well as my friend Jared. Onto my second loop. Both of my knees are starting to really ache. And I begin to realize this uncomfortable sensation in both my little toes somewhere around mile 15. Around mile 17 I realize I am beginning to chafe under my right arm, which I could have prevented with the Vaseline in my Run Special Needs Bag… FAIL. I keep telling myself only a few miles left you can tough this out. I look at my watch and realize I am still way ahead of my goal time. By mile 18 I tell myself its OK to walk a little. I walk to the aid station and have more water and a bite of a banana. I begin to jog again, which surprisingly enough does not feel any faster than my walk. I start to count down the half miles. Next thing I know I am back at that first miserable hill. I walk it again. Then I begin to jog. My toes are hurting me but I keep focused. I only have 3 miles left. I approach the second hill and walk again but keep a solid pace. I start to jog again but I am in pain. I am pretty sure my toes are bleeding and my knees are really starting to feel awful. Once I find the 25 mile marker sign, I walk. I need to catch my breath and regain sensation in my legs. I tell myself walk a half and then run the rest. I chew on some Bloks and try to keep a steady walking pace. I am delirious, I am laughing, and I am smiling. A volunteer catches me and asks if I am OK. It takes a moment before I tell him that I think my feet are bleeding. I am escorted to the medical tent where volunteers help me take my socks and shoes off. I have some pretty sweet blood blisters on my toes. The podiatrist tries to pop them and notices me freak out. He tells me I will be OK. I explain that I only get pedicures twice a year because I’m ridiculously ticklish. 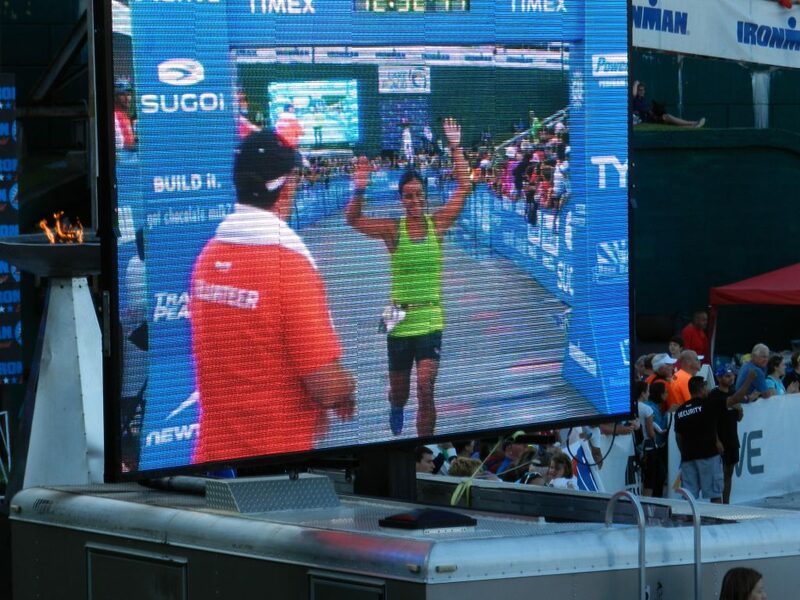 He laughs and congratulates me on finishing. I hobble outside the tent and find my parents and Jen. I am so happy and overwhelmed with so much excitement. I did it! 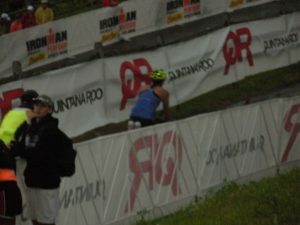 I finished one of the toughest races in the world!